Description: The story thinly revolves around power shortage aptly freshened up by ample doses of action, comedy and love. 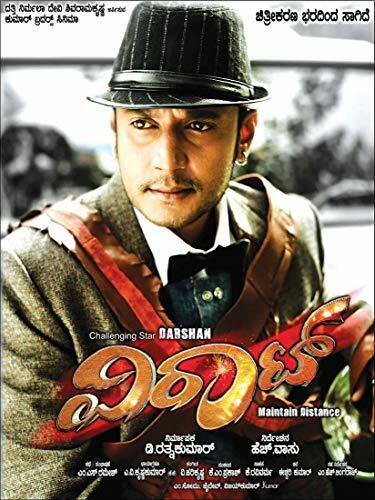 Viraat Prasad (Darshan) is a businessman who wants to provide a solution to the existing power problem and in consultation with the chief minister, a role played by Suhasini, he plans to build a thermal power project. Enter Surendra Singh (Ravi Shankar), an opportunist, who tries to distract the chief minister and take over the project. But the project is handed over to Viraat which does not go down well with Singh. Balancing the friction and the action is romance involving three ladies - Keerthi (Chaitra Chandranath), Spoorthi (Vidisha Srivastava) and Preethi (Isha Chawla), who are head over heels for Viraat, but the latter chooses one among them, managing to maintain his friendship with the other two. How does he handle Singh and the thermal project and who does he select as his love runs in parallel and forms the crux of the film.The story thinly revolves around power shortage aptly freshened up by ample doses of action, comedy and love. Viraat Prasad (Darshan) is a businessman who wants to provide a solution to the existing power problem and in consultation with the chief minister, a role played by Suhasini, he plans to build a thermal power project. Enter Surendra Singh (Ravi Shankar), an opportunist, who tries to distract the chief minister and take over the project. But the project is handed over to Viraat which does not go down well with Singh. Balancing the friction and the action is romance involving three ladies - Keerthi (Chaitra Chandranath), Spoorthi (Vidisha Srivastava) and Preethi (Isha Chawla), who are head over heels for Viraat, but the latter chooses one among them, managing to maintain his friendship with the other two. How does he handle Singh and the thermal project and who does he select as his love runs in parallel and forms the crux of the film.